ALSE is written in C++, it can be compiled with the GCC C++ compiler version 3.00 or above. You can get the source code from the ALSE webpage. The file is in the format ALSE_v??? ?.tar.gz where v???? is the version number. If everything is smooth, you should get a executable file "find_motif". <true seq file> is the full path name of the sequence file that is known to contain the motif(s). It is in the FASTA format. <false seq file> - sequence data file that consist of the background sequences, also in FASTA format. [OPTIONS] fields specify the parameters used for running ALSE. They can be any of the following, appeared in any order. When a particular option is not set or not specified in the command line, the default value is used in ALSE. The FASTA file format is used to contain multiple DNA (protein) sequences. 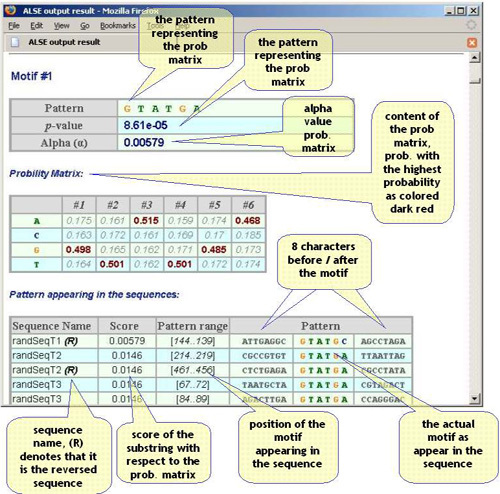 It begins with a character > followed by the name of the sequence; the sequence data follow in the next line. More sequences are listed in the file in the similar way. 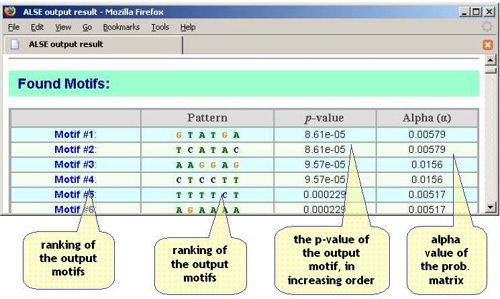 The output of the ALSE is a summary of motifs discovered in HTML format. A sample of the output can be found here. The page has mainly 3 sections. Here shows information and of the input data, including the options issued and the names pf input sequences and total execution time.